It's holiday tea season! While coffee lovers are instagramming their pumpkin lattes all Autumn long, tea drinkers patiently wait, knowing our time will come... the time when our tea cups will be blessed with heavenly dashes of cinnamon and peppermint. I got a little carried away this year and somehow ended up buying seven different holiday looseleaf blends, so I thought it would be fun to share my favourites from the group. 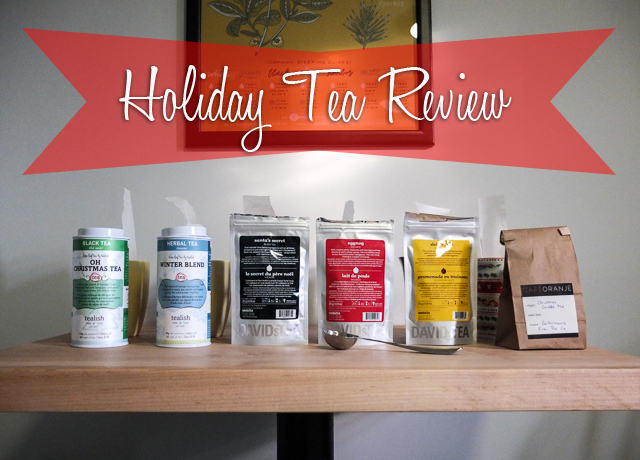 So put the kettle on, grab a cookie, and join me for Edna's Great Holiday Tea Review of 2014! Ha! Obviously taste is completely subjective. Just because I like or dislike a tea doesn't mean that you will too. So, as you read my reviews, keep in mind that I prefer relatively strong, black teas with earthy and floral notes and not too much flavouring: think Darjeeling or Nepali. I rarely like fruity, herbal teas, but they do suprise me from time to time, as you'll see below. 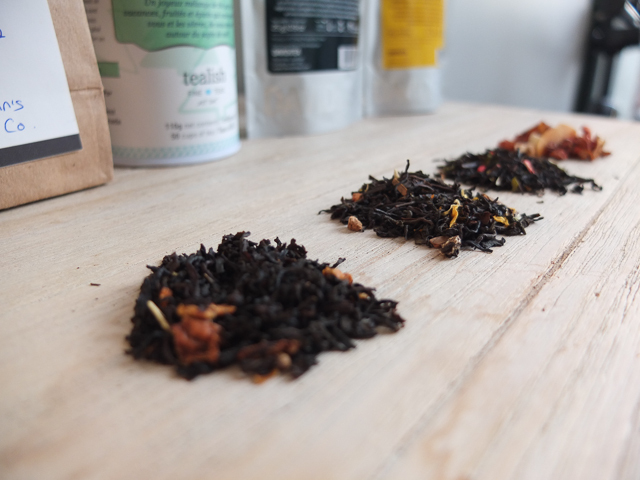 In order to best compare them all, I tasted all seven teas in one caffeine-crazy session. I kept brewing consistent by using 1-1/2 teaspoons of tea per 8 ounces of water and steeping for 5 minutes each. I did notice that some teas, particularly the Tealish teas, were too strong and retested those again afterwards with only 1 teaspoon of tea. I'm pretty pleased that my favourite of them all was the Christmas Candle Tea by Parkermann's Fine Tea Co., a Hamiltonian company! Cafe Oranje was kind enough to package up a bag for me, as you can see. The black tea (quite lovely on its own) is the focus in this blend, with cinnamon spice and floral notes on the subtler side. A well-balanced tea — the best of both worlds. 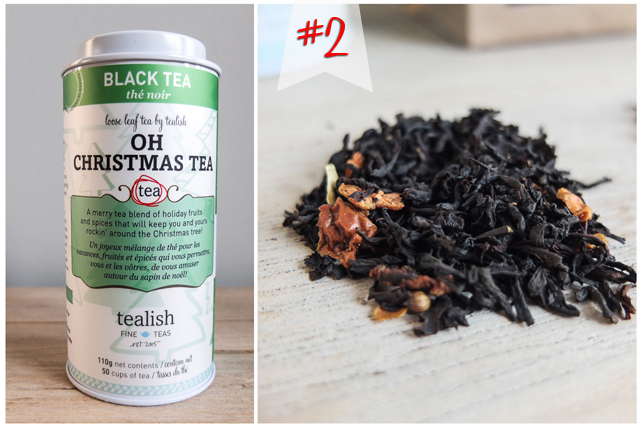 My next favourite was Oh Christmas Tea by Tealish. 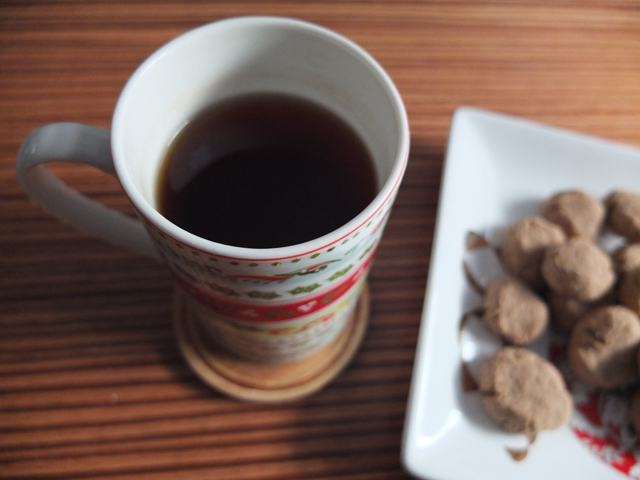 This is another black tea but with stronger holiday spices, like cinnamon, coriander and cardamom. It also has apple pieces in there which give it a cider-like nose and flavour. Funny story: this is one of the first looseleaf teas that I ever tried. Mike bought it for me about 5 years ago. I loved it at the time and was curious to see if I still would, now that I'm a regular looseleaf-tea drinker, and I'm happy to report that I do! Now this one surprised me. 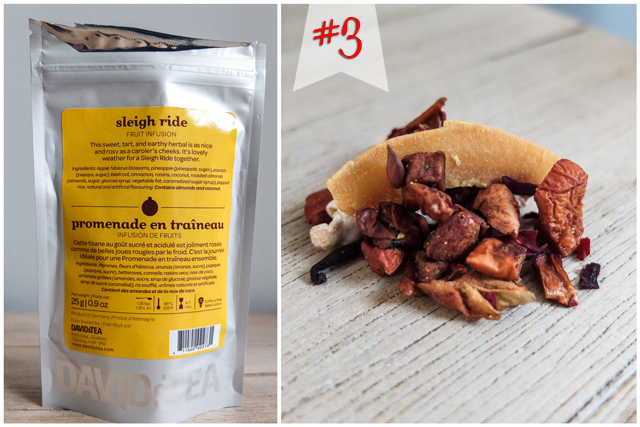 My third choice was a fruity herbal tea from David's Tea called Sleigh Ride. Like I said earlier, I normally don't go for teas without a black tea base, but I really liked this one. There is a lot going on and you can truly taste it all. Apple and cinnamon are the main flavours, but there are also notes of roasted almond, hibiscus, and tropical fruit. I'm not sure what makes it's "Christmasy", but it's still nice. 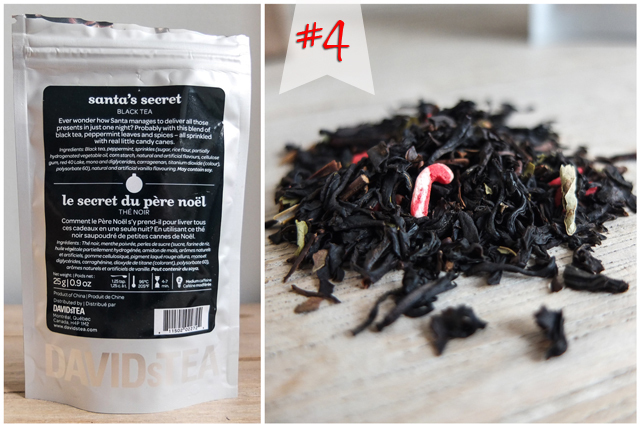 Initially, I only wanted to list my top three teas, but I couldn't not include Santa's Secret because of the adorable little candy canes! Just look at them! You can't help but smile when you see those little guys twirling around in your cup. However, cuteness aside, I thought it tasted like artificial chocolate mint flavouring, the black tea didn't stand out as anything particularly nice and there were numerous stems in the mix. Those candy canes, though! The other two teas that I tried were the Winter Blend by Tealish and Eggnog by David's Tea. The Winter Blend was strikingly similar to Sleigh Ride, but with less complexity. I found the hibiscus and blackberry were a little overpowering and tart, and the citrus notes made it taste kind of like cold medecine. The Eggnog was completely undrinkable for me. It tasted more like hay and tabacco than anything. I immediately threw it in the trash and made a real eggnog! So there you have it — the contents of my Christmas tea cupboard! Honestly, I would've loved to try more brands, especially local companies like Steeped Tea or Terra's Tea. But I didn't have the time, cash, or storage space. Maybe next year I'll try seven more! What are your favourites? 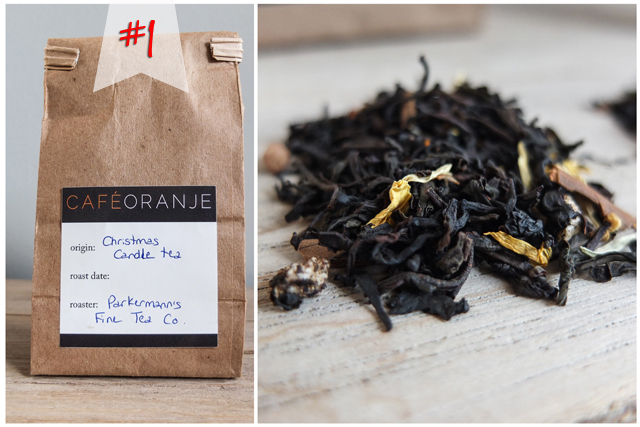 Are there any festive teas that you love (or love to hate)? Please share in the comment below! 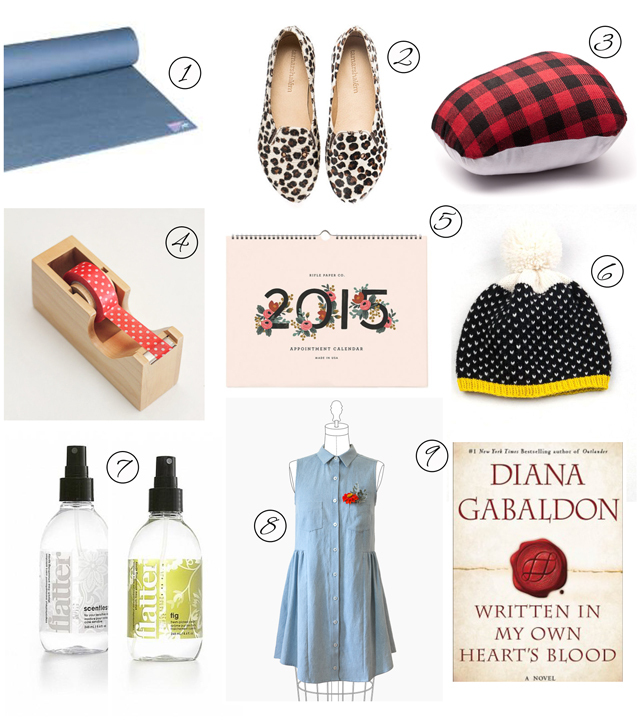 I'll admit, with only a week until Christmas, it's probably pretty late for wish lists and gift guides. But, at the same time, I'm super sad that I haven't posted a single Christmas-themed post this year! I begrudgingly gave up on my beloved 12 Days of Christmas series this year because, well... it was certifiably insane. I love everything about Christmas, so I loved doing it, but it was a lot of extra work at my busiest time. With my calm "word of the year" in mind, it just made sense to ditch the self-pressure. But then I went in the complete opposite direction and wrote absolutely nothing. Oops. I couldn't possibly leave it at that. So, now that the craft fairs are done and the online orders have slowed to a trickle, why not just cram a bunch of festive posts into the next 7 days? Haha! Are you with me? 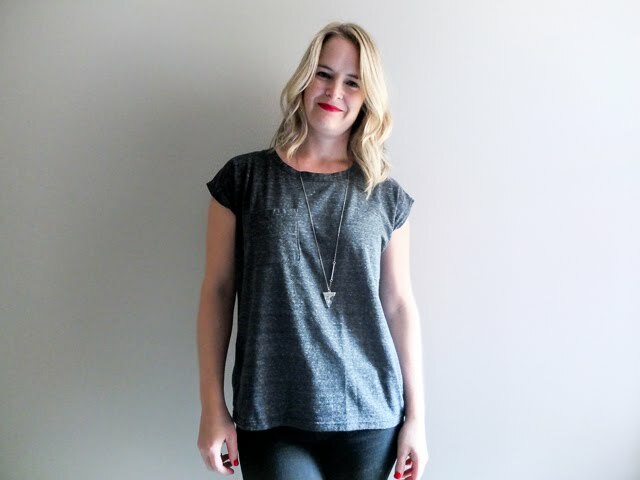 Let's start with my wish list, because I've had it half-written for weeks and because it may help give you some ideas for any hard-to-buy-for ladies still left on your list! 1. The yoga mat I've been using for over 10 years still gets the job done, but it's on its last legs. Shocker. I'm not picky about brands, although I've read good reviews about this eco Jade Harmony one — as long as my feet don't slip, I'll be happy. 2. I love my Tamar Shalem boots so much, I've been dying to get another pair. These leopard print ballet flats are super cute (and on sale). I'm also pretty smitten with the black oxfords (also on sale). 4. I'm been struggling with a growing obsession for washi tape lately. I've justified purchasing a few rolls for business packaging purposes, but it took some serious self-control to not buy every colour of the rainbow. Naturally, a washi tape dispenser is the next step in my addiction. This wooden one is lovely, but I'm also kind of in love with this bear-shaped one that will hold up to 8 rolls! Care to enable me? 5. Another obsession of mine is calendars. Most of the time I'm trying (and failing) to simultaneously use three at once: my google calendar, a monthly desk planner, and a pretty wall calendar. Overkill? Maybe. This large wall calendar by Rifle Paper and Co. could be an all-in-one solution to that problem — pretty and practical. But I also love this floral one and this monthly planner by She Plans. You decide for me, because I can't. (You can find the Rifle Paper and Co. calendars at Mixed Media). 6. I'm going to attempt crocheting myself mittens and a scarf in the new year, but a toque might be too advanced for me. Plus, there are so many amazing ones you can buy, like this handmade beauty by White Lodge Knitwear. I also love the new merino styles by Icebreaker, like this cute pom pom guy and this neat reversible one. 8. I'm still trying to sew as many new garments as I can in my free time, so patterns are always a good bet as a gift for me. Last year I asked for the Grainline Archer shirt pattern. This year, I want their Alder dress. Honestly, you can't go wrong with any Grainline pattern. I love them all! 9. No Christmas list of mine would be complete without books! I've read Diana Gabaldon's entire Outlander series and I'm ravenous for the newest edition! My final craft show of the season is this Saturday! 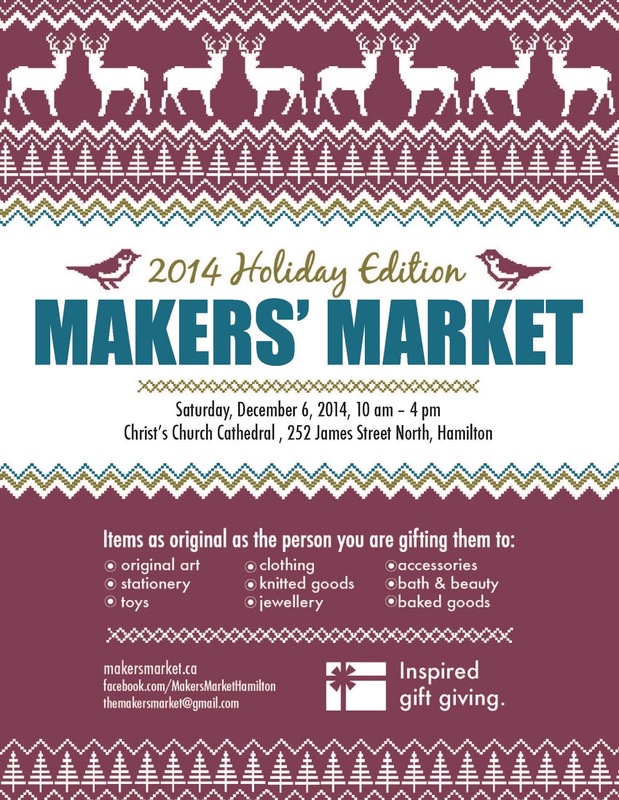 It's the Makers' Market at Christ's Church Cathedral in Hamilton. This will be the third year I've done this show -- it's one of my favourites as both a shopper and a maker. There's always a great selection of talented artists, it's a beautiful, cosy space and when you're done at the show, you can browse the lovely shops along James Street North with a Relay coffee in hand. Now doesn't that sound like a great Saturday? Seriously, you should come! Don't live in the area? Don't worry, you can still shop online for one more week. Yay!